About a year ago, I was having supper in a friend’s apartment and everything we ate was simple, and tasted really good. He’d lived on a farm near Toulouse for many years, where he worked for one of France’s agricultural organizations. Now he lives in Paris and I was surprised when he told me that the onions we were eating on the tart he’d made were from a panier, or a Community Supported Agriculture (CSA) box. He gets a weekly panier from Les Paniers du Val de Loire. I kept hemming and hawing, thinking how nice it was to shop at my local market and pick out everything myself. But I finally signed up a couple of weeks ago, and got my first panier yesterday. Living in San Francisco and working closely with a lot of farmers and small-producers in my restaurant career, I have a weakness for hard-working small producers who are trying to do the right thing. I remember a woman showing up at our back door with a box of amazing French butter pears, asking us if she planted more trees, would we would buy them? (We took a bite and said that we’d take any and all that she wanted to bring us, a promise we made good on.) I remember an organic dairy sending us their first samples, and customer reaction made us realize that people weren’t ready for the strong taste of farm-fresh dairy products. And there was Mr. Hadsell, a frail old man who could barely walk, who’d open the kitchen screen door and shuffle inside, balancing a few flats of just-picked raspberries from his backyard. You could feel the warmth of the sun radiating from each basket of plump, perfect berries. Those were the best raspberries I ever had in my life and I hope the lucky customers that got them felt the same. But elsewhere, it can be an uphill battle to find just-picked, fresh produce, even in a country with strong ties to its agricultural traditions, like France. People have forgotten what real food tastes like. Romain spent part of the summer with some people who had an organic potager (vegetable garden), where they ate mostly raw foods they grew themselves, and I remember him calling me, telling me he’d never felt better. I couldn’t wait to go down there myself. And when I got there, it was true: the food was delicious, the platters we put on the table were absolutely gorgeous. I love shopping at my local market. I enjoy seeing what’s new and in season, talking to the merchants who I’ve gotten to know well, discovering and picking up beautiful cheeses, and rifling through the bins of wonderfully-tart apples from a farmer in the Picardie. But a lot of the produce is also flown in from far away, and France, like so many other places, is in danger of losing its agricultural identity to foreign imports. There are a couple of producteurs, people who raise and sell their produce directly, but much of it comes from Rungis, which has bragging rights as the largest wholesale market in the world, located in a big, metal gray building, next to the airport. I had a discussion with someone this past summer, bemoaning the lack of good tomatoes in Paris, as most of the tomatoes were industrial ones. Like those on-the-stem tomatoes, which are meant to convey the idea of a real tomato, but are basically orbs of flavorless pulp with stems on them. 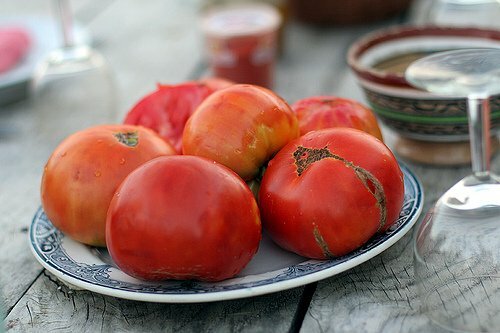 It was odd to me, since there are excellent tomatoes bursting forth all summer long in Provence. After a lengthy discussion, I’m still not clear why we get tomatoes from greenhouses and shipped across oceans when amazing tomatoes are less than three hours away. Surely les tomates anciennes must be better tasting, and even less expensive, than the ubiquitous tomates cerises? For all the silliness of books and stories about French women magically staying slim, or that everyone eating local and fresh produce, isn’t necessarily the case, even in the countryside. Huge hypermarkets have taken over. And if you drive anywhere on the autoroute, you’d be hard-pressed to find any real food unless you took a very lengthy detour off the highway. On a recent trip, after driving for nearly a half an hour after we took the exit to find lunch, the best choice, believe it or not, was McDonald’s. This isn’t a criticism of France: it’s something that’s become a problem everywhere. Eating well is a priority to me, so I’ve constructed my life so that I can take advantage of as much good food as possible, given my circumstances. Which sometimes get stretched when I just can’t resist something like tiny wild fraises des bois strawberries, œufs with brilliant-yellow yolks from chickens that get to run around and eat stuff that chickens are supposed to eat, or a runny, ripe brie de Meaux that’s so good I want to marry the person who made it and dedicate my life to somehow returning the favor. All the produce in my panier is organic. And if you’ve ever shopped for organic produce at the markets, the prices can make you gasp. (Last summer, organic cherries were €24 per kilo, #2.2, while their conventional counterparts were around €3 per kilo.) I’m more of a “local trumps organic” kind of guy, because I have a hunch that people farming small-scale in local communities are less-apt to douse their produce in pesticides. But I might be wrong.Still, it’s my health and well-being I’m paying for, and my CSA box is certainly affordable. The contents of this box, which was actually a bag (easier for us city-dwellers to handle) cost €13.50 ($20, although keep in mind that locals are paying their equivalent of $13.50, not $20). The inscription said the contents would feed “2 adults for 5 or 6 meals”. I know that French people eat smaller portions than we Americans, but it doesn’t seem like this would make 10 to 12 meals, even as side courses. But still, it was kind of a thrill to see what was in my first bag. As I unpacked the heavy brown paper sack, I found one potimarron, a plump orange squash named so because it has a chestnut-like taste. 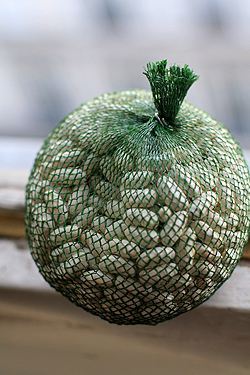 There was a small bag of knobbly potatoes, two bulbs of fresh fennel, a head of Batavia lettuce, and a nifty mesh bag of lingots, dried white beans, which I think are destined to become soup this weekend. 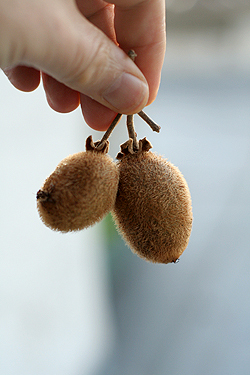 There was also a larger bag of very ripe kiwifruit, each one no bigger than a walnut. There was also a note that said they should be eaten right away. (It probably wasn’t a great idea for them to pack them at the bottom of the bag, under the volleyball-sized potimarron.) But it’s difficult to find fault with farmers who get up very early every morning, dig holes, pull weeds, and work hard to grow all this food when I’m dozing comfortably. And it really is a great feeling to do something to support local farmers when, according to the New York Times, 30,000 farms are disappearing each year in France. So I’m happy to spend a little extra, walk a little out of my way, and be in for a few surprises now and then, even if that means having kiwifruit for dinner—three nights in a row. Bravo for spreading the word and supporting local farmers! It’s funny that you just blogged about local farming and organic foods, because I just found out that a French documentary called “Food Beware: The French Organic Revolution” was released on Tuesday in the U.S. I am eager to watch it and find out how the French feel about the topic. I wish I lived in an area that had daily farmer markets or somewhere to buy local produce, but unfortunately too many people care more about the price rather than the quality. I never realized the difference until I tasted produce in France for the first time a couple summers ago, and I can not describe to people how much better ‘real’ produce tastes!!!! Thanks David! You are THE BEST!!! Formidable! Bravo! Do you know if the CSA is just starting in France? Or is it well-established by now? Every time I go I am bummed that the fresh markets are not really farmer’s markets and getting boxes is a great way around this. My friends who live in the loire fare much better since the farmers still actually come into the market once or twice a week. Ooh and how I love the potimarron. I fell in love one winter in Paris and when I got back to Oakland, tracked down some seeds at Seed Saver exchange. It is now my number one squash in my garden. I grew 3 vines and harvested about 25 this year. It makes the best pumpkin pies (sweet and savory). Maureen> the CSA is well developed in France, plus qu’hier et moins que demain, let’s say that you’ll probably have one available in large and middle size cities. But it’s a paradox because in the deep countryside of France, it’s not urbanized enough to provide a dense enough net of customers, so farmers tend not to sell baskets or boxes there. But they will eventually, every month there’s other CSA opening their services un peu partout. For example in my north middle size town, there was no CSA two years ago, now we have two different services available. As always in France, just out of the cities, bio food lovers may want to check for the little panels on the road : “here mushrooms producer”, or “potatoes, nuts, eggs”, they usually show you some local producers or even complete farms, where you can buy just as good vegetables, meat, eggs and cheese as in the boxes. I’ve had some great surprises with those sellers, it’s worth the détour. I spent this summer volunteering at an organic farm near Aix en Provence, and my god, was it hard work, my back is still recuperating. The other volunteers and I prepared all the meals using ingredients from the farm (and some from Carrefour, lol) and I had never felt better in my life. The tiny strawberries were the sweetest best things I have ever experienced. That farm also did CSA boxes, but people would drive to the farm to pick it up. They are doing CSA boxes in my student residences here in Ontario, I’ve been meaning to sign up but can never get up at the 8am registration times. Thanks for sharing your experiences! Kitty: Farming is such hard work, I’m glad to let others do it for me! Once at the San Francisco farmer’s market, a woman holding a very expensive Louis Vuitton handbag was complaining to the dirt-caked farmer that his cilantro cost $1, when she could buy it at Safeway for 39 cents. After I told the woman what went in to growing that cilantro, the farmer thanked me. krysalia: They don’t work well in ice cream because the color gets muddy, but they do make a great sorbet. However these were so small that I just squeezed them from the skins and popped them in my mouth. 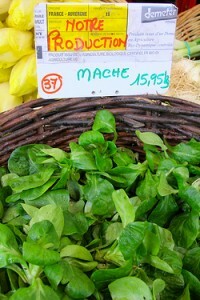 It is interesting how you can get such wonderful produce in the provences, which isn’t easily available in Paris. People have said, “Well, we’re a big city so of course you can’t find those things here.” But if New York City, one of the densest and more urban cities in the world can have a thriving greenmarket with most products from within a 50 k (100 mile) radius, why not here? I keep thinking the space where Les Halles was would be perfect. And I’d be happy to drive the first bulldozer through that monstrosity! claire: Thanks, I hadn’t heard about that film, but I will keep an eye out for it. Hi David, do you know if Les Panies du Val de Loire are part of the AMAP network? My partner and I have been thinking about joining an AMAP for about a year now, but we just moved and we’re redoing our whole flat… Once I have a new kitchen I definitely want to sign up! Hi David, thanks for sharing this. I tried going on the website to sign up, but they only have a one-year/six-month options. It could be that my French is not good enough to find all options, or it’s just that they don’t have a one panier offer at a time? There is nothing, simply nothing, like a tomato fresh off the vine! But even the “industrial” tomatoes in French supermarkets are infinitely nicer than the ones available in Britain! And the same applies to most of the fruit & veg in French hypermarkets. Here, they seem to be sold on appearance rather than taste, alas. (I’m coming to France next week and looking forward to buying the week’s fruit & veg in France, even if it is in Auchan or E Leclerc!). Here, I’ve noticed that the discounter Lidl sells much more locally-produced, seasonal fruit and veg than do any of the mainstream supermarkets. I don’t want tasteless strawberries this time of year – I want pears and Cox’s apples and the lovely Spanish navel oranges that are beginning to come into season…. Glad that you found good organic produce in Paname. We have been part of a CSA for couple of years in our 13eme hood. Our AMAP is Consom Solidaire, located on the Butte aux Cailles. 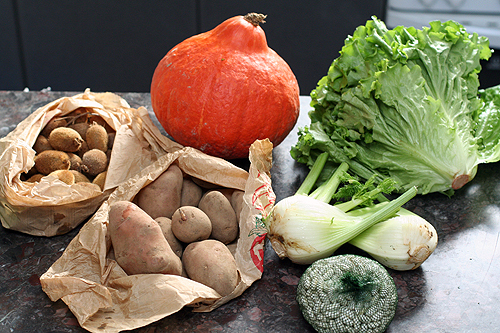 It is really nice to pick up a weekly panier of 9 different veggies (this week the panier included choux vert, spagetti squash, radish, potatoes, carrots, persil, beets and leeks). Our maraicher/farmer Ronaldo Oyama has a 4 ha organic farm in Soisy sur Ecole (http://steflolo.free.fr/spip.php?article20), where he grows 53 types de vegetables. Our AMAP, Consom Solidaire (http://consom-solidaire.over-blog.com/) is community-based association and it is a good way to know locals. People donate time to distribute produce and other fairly traded local organic goodies (olive oil, fresh milk, conte, ripe coulomiers, eggs and meat etc) to the group, take part in decision-making, and hold social gatherings and other events. It is very rewarding. And thanks a lot for your great posts. I feel it is important for all of us to make the decision to support the small artisan food producers and farmers who practice sustainable agriculture so they can continue to bring us healthy and organically raised meat, eggs, fish and produce. Food that is good for us and the planet. To me, It is worth every extra penny. As individuals we really can make a difference. People grow their own produce all over the Island here and many sell it in boxes outside of their house in boxes by the road with just an honesty (gasp!) box for people to pay. This makes for a great Sunday drive around the island to stock up on a great selection of vegetables. One place doing it more for profit than their own needs sells a wide seleciton of organically grown squash. Another sells a wide selection of different chilli’s! and lots of places sell potatoes and tomato’s. Guernsey used to grow and export a lot of tomato’s but now as industry has changed we keep most to ourselves including some lovely organic variety boxes of tomatoes you can buy. I’m sure that what you are referring to are the local small family farms. Absolutely nothing like that incredibly fresh picked produce that comes into the market everyday in season. And where I live in Massachusetts, we have a wonderful family farm that is still growing and will not do what others have done elsewhere, and sacrificed their land for the mcmansion trade-off. The Ward family has been there a long time and actually just improved their parking area from a rutted road to paved. In the spring and summer, they have pick your own–berries of all kinds, especially strawberries and then later, other fruit and vegetables. When they don’t have their own in season, they are still open year round in a large store with produce, from elsewhere. You can go in and get fresh baked bread and pastry there, or sit down and have a fresh made sandwich or soup and then leave with other goodies. And community gardens spring up more and more in the least likely places as well. We have one here in Sharon, aside from the aforesaid farm. And in Boston, near the backbay fens is another very large one–as well, just a stone’s throw from the Museum of Fine Arts, Isabella Stewart Gardner Museum and Fenway Park. How great is that kind of growing location!?!? We’ve been doing that here in rural Ohio as well. We’ve been setting up a network of people to buy good quality food from. I have a source for raw milk, from which we make our own butter and cheese. We have a great source for local pastured eggs, chicken, turkey and beef. Mr Chiots and my dad hunt for wild game. We get fresh veggies from many small local farmers and we try to grow some ourselves on our tiny bit of land. It’s so much better for sure to eat this way, we feel better, look better, are healthier and we know our environment and our local economy is much healthier as well. Local living is something I’ll be doing the rest of my life! Chloe: The Panier du Val de Loire does have a 6 week inscription à l’essai so you can try it out. That link should take you to the right place. David> I totally agree with you. I think people who sell vegetables have interest to maintain things as they are now. They stick to what people know in order to sell more and to minimize the product loss, la mévente, but this is stupid and counterproductive. And yes, a great greenmarket in the heart (or the belly) of paris would be totally possible. It’s not really farms that I refer to necessarily where I am. Some people might just have a small garden but grow more tomato’s than they need in that space or whatever it might be and so just stick them out on the hedge for people to go and buy. It’s not something I’ve seen elsewhere and doubt many places would feel confident that they would get money from those taking their goods. I particularly love strawberry and raspberry seasons though when their out all over the place and make a great snack while driving along having stopped along a road and chucked your money in the jar! According to a friend of mine, you can make excellent jam out of kiwis. Just sayin’. Our veggie bag supposedly would feed 2 vegan adults for 1 week. In fact, it feeds two veggieloving carnivores for 4 days. Maybe we eat like pigs, or maybe they expect us to eat a lot more grains. Bon appétit. I live in Baltimore, and my husband and I signed up for our first CSA this year after years of shopping at a local producer only farm market. We still shop at the producer only market, but I feel like CSA has really tied us into the land and the growing season like never before. People (friends, family, coworkers) are always shocked that we spend so much money on food, but I’m shocked that they don’t care more about where their food comes from. Yes, produce or meat or dairy is cheaper at the big box store, but do you know where it comes from? And more importantly, do you know it tastes HORRIBLE when compared to its counterpart from the fresh market. I just got my last CSA for the season this week. They generally start in May/June and finish in November. My farmer is organic, but will often trade with other local farms to provide some variety. I have learned in 4 years of participating that one has to be flexible. This summer we had a tomato blight so there were no extras for sauce; last year was an overabundance of zucchini. I have also come to appreciate many veggies I would not have given a second look. The challenge with CSA is that you have to be ready to cook (or can), but the experience definetly makes for better eating! Beth: Interestingly, last summer we were in the countryside and went past a large garden with a man selling produce from it. We were hard pressed to spend more than €10 on the huge haul. And that was enough to feed 4-6 people for a few days. Because this box is delivered to Paris, the cost (of course) is going to be higher. But even though the prices are somewhat higher than in the stores (I’d say what I paid €13.5 for might have cost me half that), it didn’t break the bank. Plus I never would have bought so many kiwifruits…now I know I’m getting my potassium! Gorgeous as always. 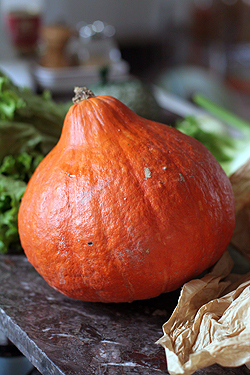 I follow in Reader and HAD to click through to find out the name of the beautiful squash! What a treat that http://www.joythebaker.com suggested your site! I love the person connection to farmers that membership in a CSA brings – and also have found that many struggle with out to be impromptu about cooking with what’s in the bag or box that week. To help, I’m just putting the finishing touches on a cookbook for our CSA members that provides 200 recipes indexed by every vegetable our CSA farm provides. Can’t wait to see it! 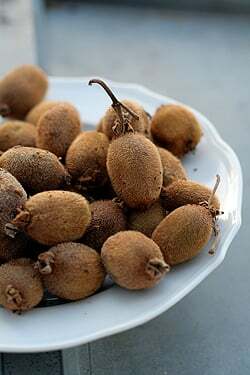 Angela: regarding the kiwis, these tiny ones come from a vine that is very hardy. I forget exacly which variety it is, but we can grow them around here in Zone 6, which is south-central Pennsylvania (Gettysburg area). I was really surprised to find that we could actually grow kiwi here! You need a male and a female vine to produce fruit, and they grow upwards of 10 feet high. Hallelujah and amen, David! Love all your writing but this is the first time I’ve felt moved to comment. We started a CSA box last January — Northern California is embarrassingly loaded with year-round local produce — and we’ve become evangelists about the quality of the produce and the affordability. Crisp, tender carrots; buttery walnuts; and varieties of tomatoes I didn’t even know existed. Small box costs about $13 a week through our farm, Terra Firma in Winters, CA. I looooooove fraises des bois. I eat them when I can go to my grandparents’ chalet in the Alps, but you have to get there in June, before the tourists have eaten them all up. I’m always amused when people tell me “ew! animals might have peed on them!” Maybe. But they taste like delicious amazing strawberry and not pee, so I don’t care. Yay! I get a panier from the Val de Loire, too, and I’ve been happy with it for the last year. Love the element of surprise, and I figure to get that much organic produce at the market would cost me at least twice what I’m paying for the panier. I recently started an offshoot blog dedicated to the panier – http://seasonalmarketmenus.wordpress.com – where I post my panier’s contents the day I get it, talk about some of the plans I have for the stuff, and then later do an update with some of the results. So far it’s managed to convince a couple of my friends here that they need to sign up, too, so I guess it’s working. This is a post that truly tugs at my heart strings. I’m from San Francisco and moved to New York City earlier this year. It has been very difficult to find high quality, consistent and organic producers. At this point, I’m in the camp that chooses organic over local, which is the reverse of when I was living in the bay area. Like you, my family and I have constructed our lives to take advantage of good, fresh foods wherever possible. I’ve research ranches, ranges, and other farms, including visiting the facilities whenever possible. Before purchasing an item from the farmer’s market I always ask if they spray. I was quite disappointed with one incident where the farmer claimed they didn’t spray, only to discover when I visited that the farm sprays weekly, every Tuesdays. This experience has spoiled my trust in the local farmers, and has made me more militant about thoroughly researching a farm before purchase. Thank you for clarifying the notion that the produce market in France hasn’t been infiltrated by industrialized fruits and vegetables from other parts of the world. For some reason I just thought that the French would be resistant to purchasing lower quality produce when they have a perfectly good source at home. Also, I’m glad to know that some French people get fat too. It’s takes off some pressure from this American! I WISH it were easy to find great tomatoes in Provence. 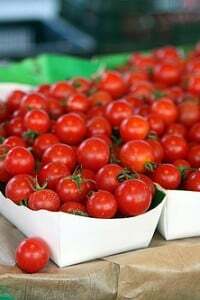 It is actually hard to find really tasty ones at the markets where resellers dominate and many tomatoes are grown for transportation hardiness rather than flavor. They exist, but you have to hunt around for them. I’m French, my husband is american, we are moving back this winter for complicated healthcare problems.. I have him read WTF, just to be prepared…. it’s in Limeil Brevannes. You can take the line A of the RER to there. Or much faster you can take line D to Villeneuve St Georges and then bus J1 or J2. It’s very small but it is very good quality. When I lived there (about 7 years ago!!) they took pride in providing Fauchon. I would think they would do demi-gros. And even if they don’t you can ask them for addresses, they are very friendly. Excellent post. One of my favorites. And I have never seen such tiny kiwis! My parents have an acre in Portugal where they grow various vegetables and fruit, potatoes, green beans, courgettes, aubergines, apples, pears, grapes, lemons, limas (don’t know the English name for them but a cross between orange and lemons) kiwis, raspberries, tomatoes, oranges, clementines, cherries, passion fruit, nectarines, plums, melons, corn and I’m sure I’ve missed some and they spray some of their crop once or twice a year depending. I would like to point out that the standards set by the European Union Organic Regulations 2004, means the Organic crops ARE treated, with strict limits to the use of artificial chemical fertilizers or pesticides, but still treated. Antibiotics for animals are also allowed but kept to an absolute minimum. I would rather support a local farmer who may not be able to pay for the organic certification but has all the beliefs and practices of the organic ethos. The area I live in is 15 miles from London and I’m surrounded by supermarkets which are good for condiments and ethnic ingredients but trying to find a farmer’s market is impossible, even the greengrocers have disappeared. My best bet is to travel into London on a Sunday morning for a well established farmer’s market, but I can hardly call that my local! I have tried the box scheme years ago when I had my first child but for a family of five now it isn’t very practical as the balance between the necessities like potatoes are out of sinc with say two bulbs of fennel, but I like the idea of the scheme. We travel to France every year for holidays and have often commented on how bad the food in motorway service stations are, and this is coming from someone who lives in the UK! This Summer we had terrible experience with restaurants in Le Touquet & Honfleur but then had a sublime meal in Bayeux. I too get vegetables from a CSA. I love them! It really makes you search sometimes to find ways to use the vegetables they put in your bags. Loved your post! David, This is a beautifully written and very thoughtful post that underlines the fact that the most political thing all of us do almost every day is decide how and where to buy our food. I’ve been getting vegetables from CSA for a while now, and the other thing I love about the miscellaneousness of what each delivery contains is that it challenges me to invent to many interesting on-the-spot recipes. I made tagliatelle with sauteed pumpkin, toasted pumpkin seeds and some Fourme d’Ambert after the last arrival, and could do a book of all the wonderful soups I’ve been encouraged to prepare by getting my veg this way. Its like you read my mind…i’ve been researching CSA’s in the Southern California area. I don’t have time to go to a farmers market. By the time I’m off work, they’re all packing up, or all the good stuff has been picked over. I found one and emailed them for more information. I like that they even provide recipe suggestions for the box of goodies. When I read what you wrote about the raspberry guy, i kinda got choked up. Not sure why but the image is very…heart-warming. We get out first CSA box on Saturday and I’m dying to know what we are going to get – it will be like Christmas! This is a great post–very informative and a pleasure to read as are all of your posts. Recently moved to San Diego and heard a local NPR report that the best oranges in the world (sorry, Florida) which are grown in the area go where? Asia! Whereas the ones sold locally in supermarkets come from where? Australia and South America! Then people called in and raved about buying fresh, locally grown oranges at farmers markets and crying, they were so sweet and juicy. Of course, they also don’t last all that long because they are PICKED FRESH. I can hardly wait to discover one of these sources. BTW, my CSA in Seattle threw in a bouquet of flowers each time too. Beautiful! Thanks for a lovely post (as usual). I was in France over the summer and we were talking with a friend who works with an organic certification in France. We were talking about organic vs. non-organic; local vs. non-local, etc. One of his main arguments was that fruits and vegetables have been modified (through natural breeding, not necessarily GMO) to be able to be transported further and further away from their production sites or/and to resist diseases (that’s why your taste-less tomatoes were most likely grown “hors sol” in Holland!). Some organic produces have also been modified but because people who are willing to pay more to purchase organic produces don’t care that much about shape, color and size (like your kiwis), it has been possible to re-introduce older almost-forgotten types that indeed taste better. If, on top of that, you purchase them “locally”, then you are getting more tree/soil ripe produces. As we were talking about the fact that, in the US, we get food from as far as China (the US produces more than 40% of the worldwide soy beans, so why should I get them frozen from China, please? ), this friend told me about the success of the AMAPs in France. I managed to find CSAs in Philadelphia. I think I’ll try it next year. We are fortunate enough to have good farmer’s markets around here (maybe they spray, I don’t know). It’s a challenge to cook with just “local” produces that are in season (when you live outside of California) but I find it a nice way to be creative…and to discover new vegetables/fruits while sustaining local activity. In a way, I miss my grand-mother’s potager! Thank you for the post, David. This potimarron looks really appealing! What the hell did you do with the tiny minikiwis? azelia: That’s one of the reasons I’m more of a local-guy, than strictly organic. I just think it’s more interesting that “real” people raise the vegetables rather than buy those that have an ‘organic’ label on them, that might be flown in from across the globe. Mel: I split them with my finger and just slurped them out: they were delicious. Camille: Thanks for pointing out your CSA blog. Will follow along and see what you do with your haul! Sheauenen: I remember once, when he was getting really old, and he dropped the few flats of raspberries that he was carrying because of his age and I almost cried, too. He was a little disoriented at that point but wanted to keep bringing us his raspberries. I think eventually we sent someone over to pick them up after that. Alec: I say you and I get the bulldozer and just take matters into our hands with Les Halles. We could probably sell tickets! Christine: Just like anywhere, France is feeling the pains of globablization. For one thing, Paris is a very expensive city and frankly, produce shipping from other countries is a lot cheaper than most of the stuff raised in France. (French workers make quite a bit more than those in other countries, hence part of the price difference.) So when confronted with a head of locally-grown broccolli for €4 versus one for €1.50 from Morocco, well, that’s a decision that we have to make here. And it was interesting that the ‘French women don’t get fat’ phenomenon took off. Americans really gravitated toward that book. True, in Paris, people are in better shape than in the provinces. But it’s like going to Los Angeles (or another city where people work out a lot) and saying that Americans are all fit and firm. There’s all kinds of people here but because eating habits are changing (thanks for McDonald’s and other convenience foods), people are expanding. David: I have read your posts also about some of your trips to Italy. Have you ever been to one of the Agri-tourisme family farms and restaurants? We were there a few years ago, and it is a way to sell and showcase locally grown produce and have a meal as well. They were very busy and had fabulous everything there. We were only at one of these in the area near Venice and Vicenza, but there are certainly many more throughout the country. David, I think the reason the grocery stores buy tomatoes from greenhouses rather than from the farmer down the road is because they want to deal with one supplier. I have talked to the produce guy at my grocery store because I am so frustrated with the same issue. Why is chard so expensive in Wisconsin? It grows here! Abundantly! He tells me they get all their produce from California. All of it. All year round. Their buyer wants to deal with one supplier. Just one. It makes his life easier. Even though he pays higher shipping costs and we don’t get the freshest produce, he has one supplier. It’s not how I would do it, for sure. I would have a California supplier for winter, but in the summer, I would buy locally. But I’m not the one in charge. class factotum: When I lived in San Francisco, I was a few blocks from a Safeway store. A friend who was a manager at another Safeway said to me once, “You should tell the manager what you want. We’ll order anything that people request.” So I went in and told the manager that they should carry aluminum-free baking powder, and soon afterward, they started carrying it. Then I noticed other products showing up, like Straus milk and butter, ScharffenBerger chocolate (when it was still locally-made), and other things like that. Those French butter pears I mentioned from Pettigrew Farms eventually showed up at Safeway as well. Most stores are in the business of making money and they want to sell things. Yes, it’s easier just to order from one supplier. But if customers ask for things and support them by buying them, like non-UHT heavy cream, hopefully they’ll continue to keep those things in stock. Sandra: Yes, I have. And it was pretty interesting, and good food, too. The WWOOF-ing program that I linked to in the post is a program for people to live and work on a farm in exchange for lodging and board. Not all are as good as others, but Matt Gross, the frugal traveler, did and wrote an interesting article about his experience. having lived in san francisco for 7 years, i can relate. we try to make it to france once a year and every time we leave, i find myself mourning for the tastes and smells. David, have fun with your CSA bounty! We joined one in the Washington area three years ago and have loved it. Sometimes, the weekly pick-up and full box seemed relentless but it was so fresh, we supported a local farm and were forced to learn what to do with a few new (to us) veggies. It is a weekly adventure and a gift. I was indescribably sad to read that the best place you found to eat after driving a half hour was a MacDonalds. Such things should never happen in France. Or anywhere for that matter. If you can arrange a tour (I found a private operator, otherwise they want groups of at least 20), Rungis is an experience you won’t soon forget. Nothing like entering the “Triperie” at around 6 am in the morning. Also note they have a pavilion devoted exclusively to local farmers. And one just for cheese! I just love your blog! I read it often and just simply love it! So surprising, to me, that Paris would have a lack of locally-grown produce. I don’t know why — maybe because everything’s supposed to be better in there? Although, the lack of winter squash (per your pumpkin ice cream post) should’ve been a warning sign. By the slice? What are you supposed to do with a slice of pumpkin? Glad you found your source, and have been forced to eat your fennel. French Cooking FD: On the Local Harvest website, I saw a few in the LA area. There is Terra Miguel in the Los Angeles area, that is a CSA, but if you have a good farmer’s market, you’re fortunate. Happy shopping! Katy: Like most big cities, in Paris, finding locally-produced fruits and vegetables can be a challenge. There are a few reasons, which I mentioned in my book, but the issues are pretty complex and some of it just is because people are busy and don’t have time to shop and cook. Another, as I mentioned, is that small farms are disappearing rapidly here in France, as they are elsewhere. Jean-Marie: The autoroutes don’t yield good places to eat. There are two chains which dominate (Autogrille and l’Arche, both of which are reminiscent of Denny’s) and the government just granted permission for McDonald’s to open along the autoroutes, which I’m sure they’ll be doing as soon as possible. There is a chain in France, called Paul, which has pretty good pastries and sandwiches (they’re owned by the same company that owns Ladurée), which is a concept that could easily be expanded to the autoroute. I’ve seen a kiosk at one of the stops, but it would be great if there was more. I was just making a tomato sandwich the other day, and was so disappointed. It was completely flavourless and bland, resembling nothing of the vibrant, delicious tomato I keep dreaming of. Summer is just setting in in Australia, and we’ve already got weather averaging 40 and above degrees a day – celsius. All I want to eat is salad, but all the vegetables I’m finding are so crappy and bland and really unappetising when raw. I really don’t want to sound like a ranting activist here, but the global lack of fresh produce is, of course, a sign of a much bigger issue. If 30 000 farms close in France each year alone, then I wonder how many other farms are closing around the world? You’ve said it yourself, the best option you could find on the road was McDonalds. TNCs make me want to vomit. Thanks for all of your posts promoting local food!! It’s always refreshing to stop by and have a read. YEA for getting on the CSA bandwagon. Been doing it for years and the one that I belong to is part of the SLOW food movement here in the US. The lettuces I get each week are a work of art. Produce tastes so good and makes for very flavorable meals. Congrats on taking the plunge. John: It’s always unfortunate when the term “elitist” is thrown out when talking about ordinary, non-processed food. Most of our grandparents ate that way before frozen and fast foods became so prevalent, and they could hardly be called “elitists”. I’m not sure why that is, but it would be great to find a way to get good, fresh food to a wide range of people while still paying the people that grow it a decent wage. I think these CSA boxes are a way to get there. I read about one in Brooklyn where the farmers just bring loads of stuff and everyone brings their own bag. When you arrive, there’s a list of what everyone is supposed to take. (ie: 5 apples, 2 heads of lettuce, etc..) It seems like a great way to lower costs and work involved, and seems like a great way to meet other cooks and exchange ideas. I’ve been a member of a CSA in Northern CA for several years now. CSA’s enable the small farmer to have an acutal financial base s/he can count on, instead of the market. Ours is pretty large (about 400 members). They deliver (for an extra fee) or you can pick up at the farm. There’s the political aspect of helping keep the land in agriculture instead of becoming housing/shopping centers etc. An important point where I live. 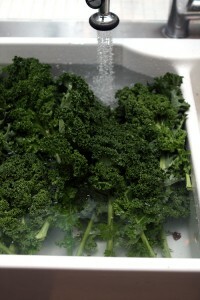 As well, as the freshest food possible (picked either the evening before or that morning). Our CSA has a program where folks can trade for a box (someone has to fill those boxes). And they contract w/ other local (or quasi-local) organic farmers to fill in the gaps (esp in the winter). Always telling us where the produce comes from. All for $17 a week. Wow! Thank you for sharing this story with us! I always always enjoy reading your blog (and cooking your recipes- your altoid brownies are always a HUGE hig), and this was lovely to read. There are lots of small farms where I live, outside of Los Angeles. I’ve been thinking of signing up for a CSA, since like some of the above commentators, I work too late to get to the farmer’s market. David, if people have forgotten what real food tastes like they also have forgotten what it looks like. I especially love the picture of your tomatoes for this reason. We have grown so used to polished, shop-perfect, produce that we now have unreal expectations of how our produce should look. Bananas are the obvious example for me. They are shipped abroad green and arrive with perfect yellow skins. In fact it’s when they start to get some spots that they are at their sweetest. My other solution, though, was to plant my own garden this summer, which meant I had to leave lettuce, tomatoes and zucchini on my neighbors’ doorsteps at midnight. You know how that joke goes: Why do you lock your car while you’re at church during the summer? So nobody will leave zucchini in it. I am très jealous. The wait-list for a CSA program was so long when I lived in California that I moved before I ever got the chance to sign up – and where I’m at now wouldn’t know what a CSA was if I hit them with that gorgeous orange squash you’ve got up there. class factorium & Mark: Oddly, I checked the LA-area CSA website and was surprised to find there wasn’t that many of them. Perhaps because of the traffic in southern California? But there are great farmer’s markets down there. Mary: Glad you like the brownies! Hi David, great post! From my own WWOOFing experience, I gained a tremendous appreciation of the amount of work that goes into raising anything – particularly organic produce. And that’s despite the fact that you could barely call the place we stayed a ‘farm’… more like a goat-pen with a few fruit trees. A question: I’ve been looking around for anything like the CSA model in Germany, and I’ve found organic box schemes but no real CSAs. Is yours a CSA in the US model where you buy a share in a specific farm and assume some of the financial risk for the harvest? Melissa: I read the site of my CSA and it says that the purchases support around 100 people and their farms. But didn’t take the time to read all the print. There are a few organic box ‘schemes’ as you call them (good word choice!) where the contents are organic, but feature pineapples and such. And like you, I’m more interested in promoting the local folks. Once you have tried to grow your own tomatoes, you will appreciate pesticides and want one that kills squirrels and rabbits. I just wanted to stop by and sing the praises of my CSA in San Diego. It’s $25/week, delivers within 2 blocks of our apartment, and easily feeds 2 adults for a week. Actually, my husband and I are switching our subscription to every other week, as we’re actually overloaded with veggies. We love it. What a lovely sentiment, perfectly expressed. this is all quite disturbing. I worked for a large and interesting CSA in Australia, which invented a twist on the usual CSA delivery scenarios. Instead of delivering to individual homes, or having to go to the farm to pick up your produce direct, we had a network of ‘city cousins’ across the city. These were schools, churches or people’s homes, where your box would be delivered once a week on a particular day. This meant that not only were people in the city eating local farmer’s produce, but they were meeting other people who were doing the same thing. 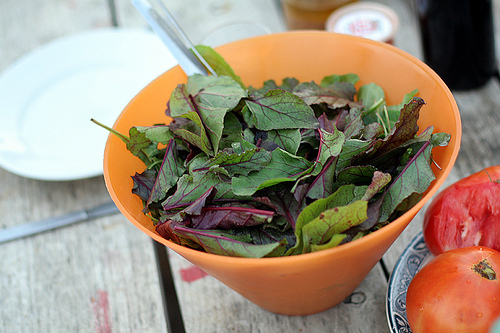 I’m hankering to find a good CSA in Berlin (my new home), but struggling to find one. Any tips greatly appreciated!